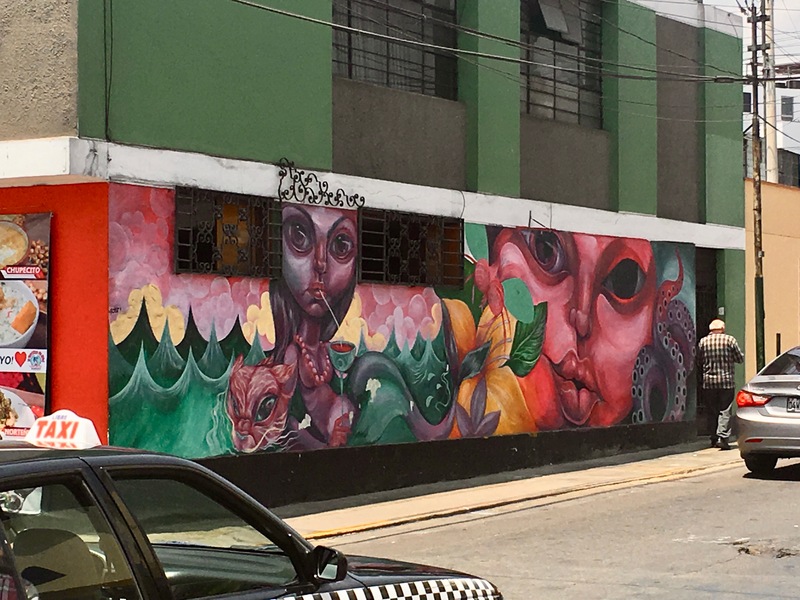 A while back I shared some photos of the local street art in Barranco. 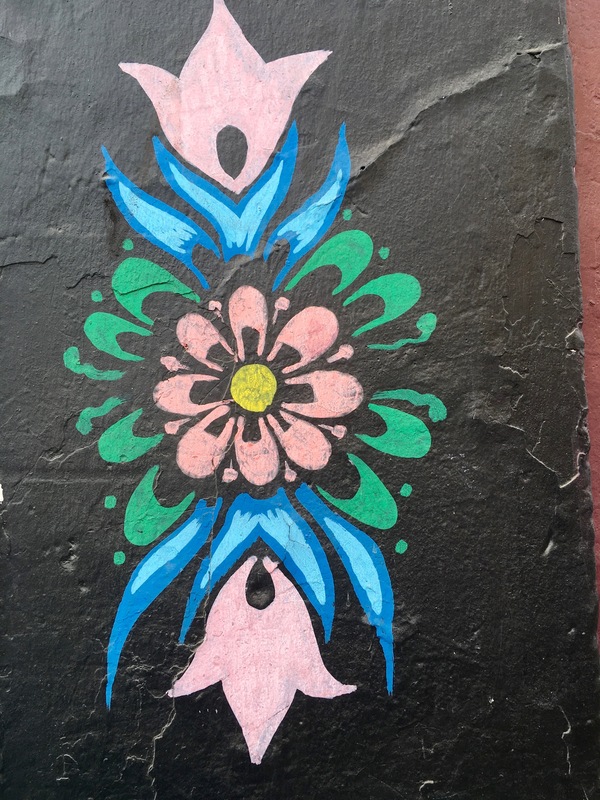 And when I say “some,” I really mean it: Barranco is a painted city. Whelp, I’ve collected another batch of graffiti / murals and done my best to find their stories. Again though, I’d love to learn more! If you can share anything more about these images, comment away. Miguel Grau (usually known just as “Grau”) is the main street running through Barranco if you want to hit restaurants and shops. Just off Grau, right on the corner where Barra Mar and the new Veridico del Fidel are located, there’s a street that’s painted pretty much from stem to stern: 28 de Julio. 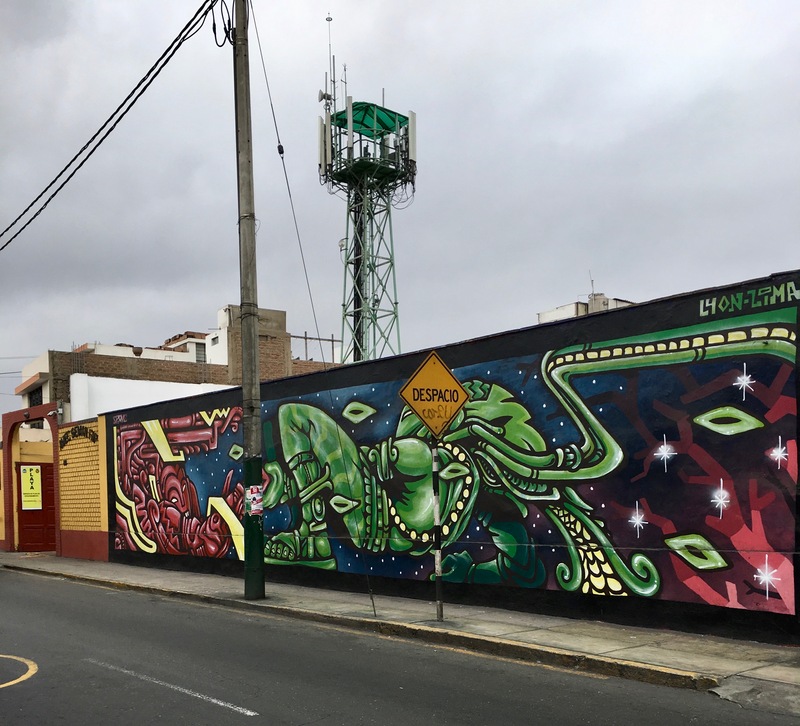 If you’re walking down Grau, you can most easily find the street by looking for the “Suspiro” show stopper by Ruta Mare, a Peruvian graffiti artist with a particular talent for bright, bold lettering. 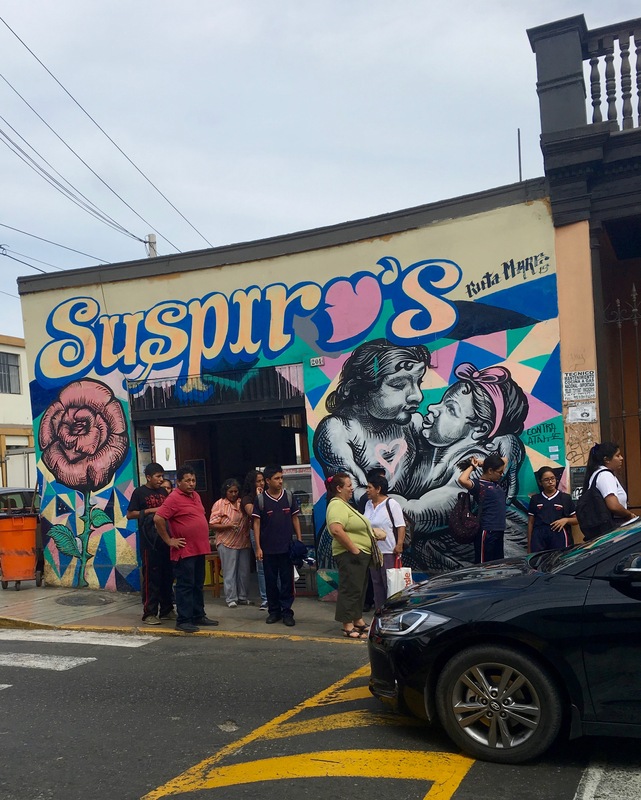 The pair of lovers, I’m assuming, reference the Puente de Suspiro only a few minutes away and/or the “suspiro” dessert that’s so popular in the area? The word “suspiro” technically means “sigh”, but by context I’ve gathered that it’s better translated as a “lover’s sigh”; there’s definitely a romantic connotation. I’m a little confused by the apostrophe (which I don’t think are used in Spanish? ), but my Spanish is far from competent enough to go nitpicking grammar. 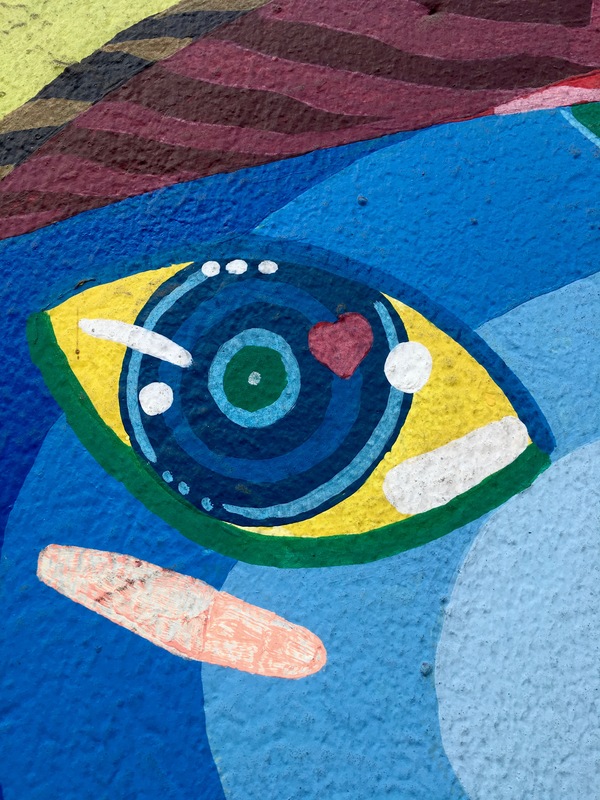 With my back to the wall of Ruta Mare’s mural, alongside the Veridico del Fidel, I was able to get a photo of a mural featuring two characters with enormous, bulbous eyes. The intersection here is a little sticky to cross, especially for a girl from the suburbs, so unfortunately I don’t have the artist’s signature: It’s such a distinct style, though. Surely this artist is a Lima local too? One character looks like a mermaid sipping wine through a straw while the the sky rains flowers and she pets her cat-like dragon. The other close-up is of a red-faced individual scrubbing his/her face with an octopus? Whatever, I like it. 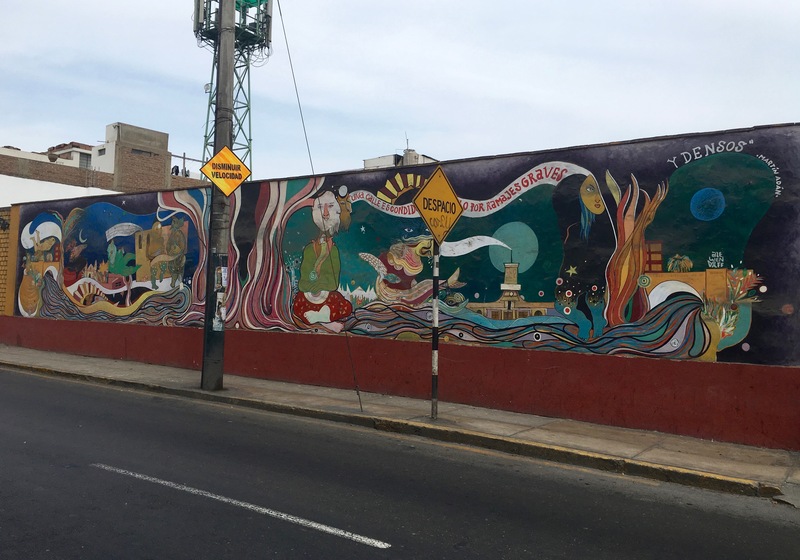 And down toward La Milanesa and the Burrito Bar, which are both just a minute past Ruta Mare’s mural, is another small mural of interest. I really like the mysterious character in the green hat, but I can’t quite suss out what’s going on. 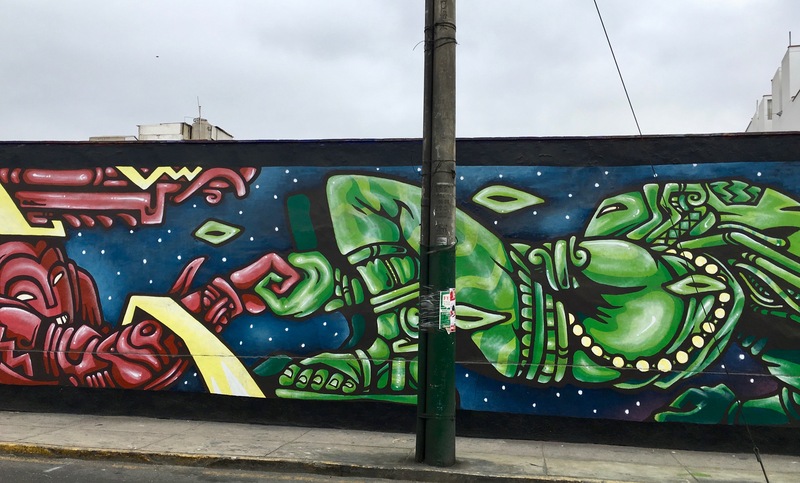 My uneducated guess is that we’re seeing a native character in traditional clothes with a wooden mask… He’s juicing a brain in his hands, pouring intellectual “content” all over Barranco? “Tattooed” on his arms are the words “Barranco” and “Family”. Finally, before you start heading down the little side street off Grau, you should stop in Blu for a gelato. Only once you’ve got gelato in hand should you start checking out the murals. 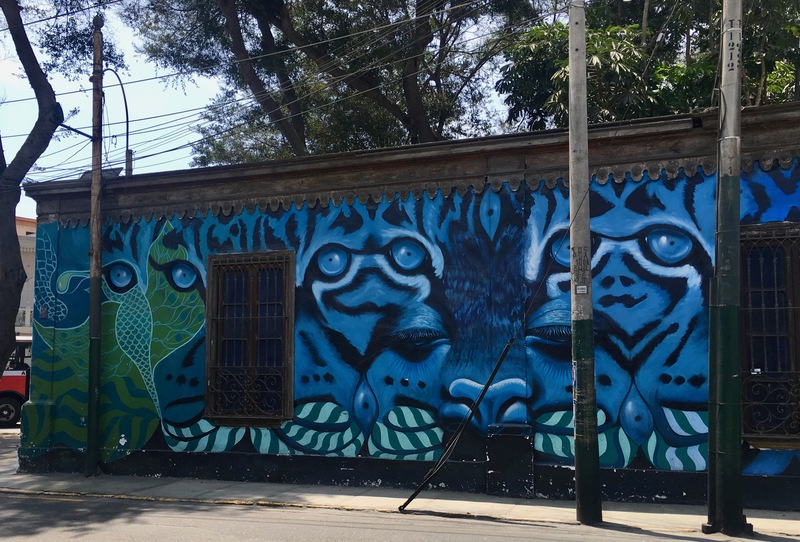 Among the first in this outdoor gallery is a wall that’s been re-painted at least three times since I’ve been in Lima. It’s along a big outdoor parking lot (a “playa”). A few months back, I remember a stunning abstract mural with swirling pinks and whites framing a turquoise and navy sky. Alien-like creatures sang to each other, a strange man sat with his legs crossed, and a mermaid danced on the waves. A white banner rolled across the night sky with a quote from the tragic poet Martín Adán: “Una calle escondida del cielo por ramajes graves y densos” (Roughly, “A street hidden from the sky by thick and dense branches.”). I adored this mural. I believe it was done by “Ale Wendorf“, who has a lot of her fantastic work posted at her website. Her style is haunting and sort of gruesome: a little bit Picasso, a little bit Where the Wild Things Are, and a little bit Scary Stories to Tell in the Dark. 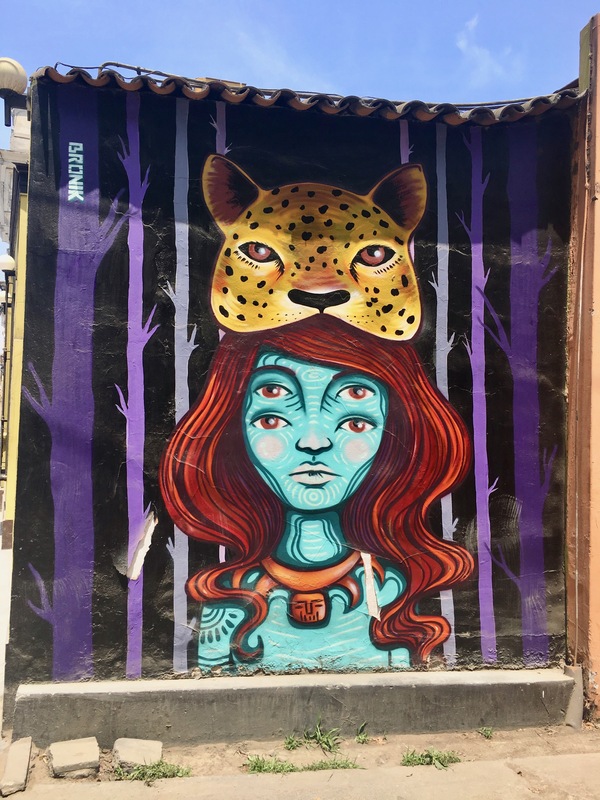 I haven’t been able to recognize anything else by her in Barranco (or Lima), but I’d love to know if there’s more. But street art, by its nature, is ephemeral. Eventually Wendorf’s mural was replaced… by a large mural of a shoe. Yes… a shoe. A very large sneaker, specifically, which I seem to have lost my photo of. However, to be blunt, after Wendorf’s mural, I can’t say missing out on the floating sneaker mural is a huge loss to me. Currently (as of October 2017), the parking lot wall now features a more competitive replacement, in my opinion: Two deities link hands as they whirl through space, the movement and strength making it unclear which one is pulling the other, or if they’re just linked and letting some planet’s gravity do the work. I’ve gone nuts clicking on everything related to “Lyon Lima” and “SPOVE” (Spuve? Spewe? Spow?? ), and I can’t figure out who this artist is. That “Lyon Lima” tag in the top right of the mural is so familiar looking though: I know that tag! Can somebody enlighten me? This sort of comic book style is fantastic and bold, and I’d love to know if this mural has its origins in any specific myth. Next up, opposite the parking lot wall, you hit an dizzying black-and-white mural. The Shipibo Conibo Investigation Center brought this one to the street, and the intricate patterns come from the indigenous artists of the Shipibo-Conibo tribe. Conveniently, the next mural was tagged with a website: ceyzer.com. His body of work is pretty diverse, but much of his work seems to feature colorful geometric patterns. 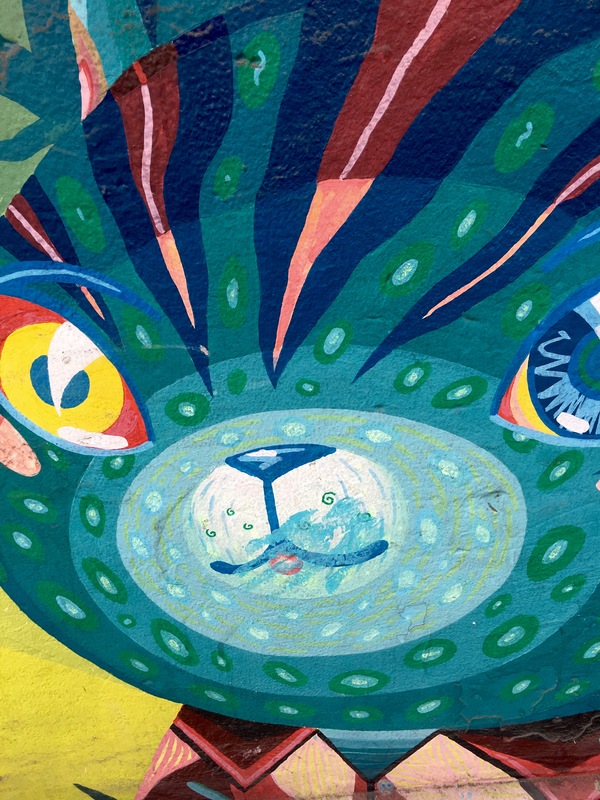 Obviously, some absolute asshat has scarred this beautiful street of murals by slapping blue hand prints and tags down the walls: Whoever you are, there’s a gringa in Barranco who thinks you deserve to stumble into an open manhole. But despite the disrespect, Ceyzer’s mural is still lovely. 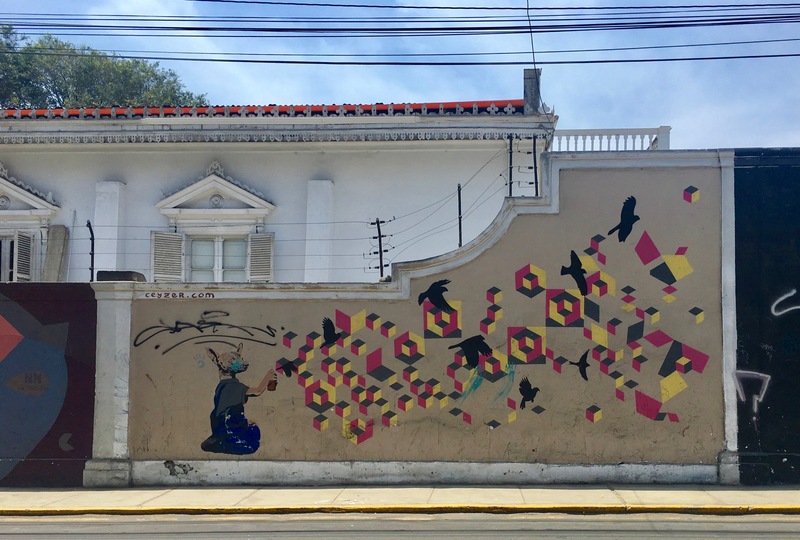 A vaguely Banksy-esque hairless Peruvian dog in painter’s overalls kneels, spraying out a bright geometric explosion of color and birds in flight. It’s simple, in the sense of how much negative space is left, but touching. Maybe it’s at least partially a sort of self portrait? N.N. Decertor did the next mural, which is an obvious manifestation of serious artistic skill. His murals are often hyperrealistic portraits paired with abstract backgrounds and highly symbolic interacting elements. It’s my understanding that this one reflects the suffering of people whose loved ones were “disappeared” during the 1980s, specifically the sense of loss and shock felt by a mother for her lost child. 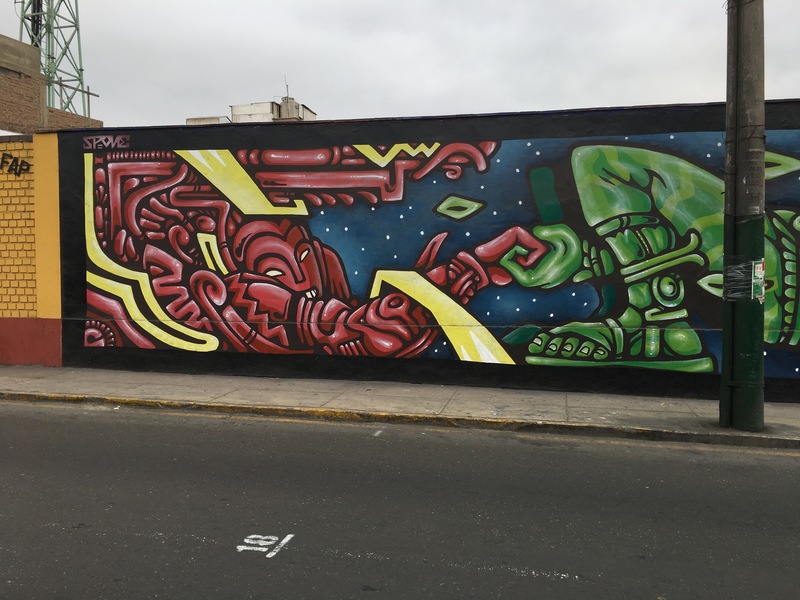 It’s also my understanding that this is a fairly ballsy thing to represent so boldly: The 1980s weren’t that long ago, and it seems like sometimes Peruvians are still (albeit understandably) shellshocked from the period. An older woman, her own image echoing out in a shattered trail behind her, reaches out towards a ripped up photograph of, I’ve read, her child. 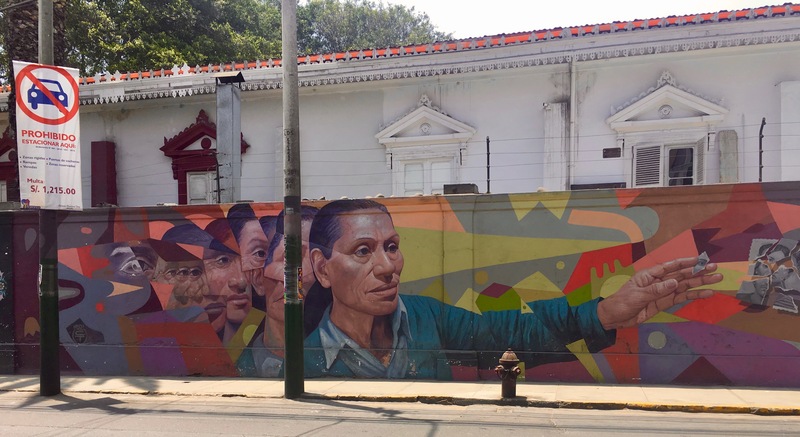 A big Los Salvajes mural spans two segments of wall, and it fills the space impressively. 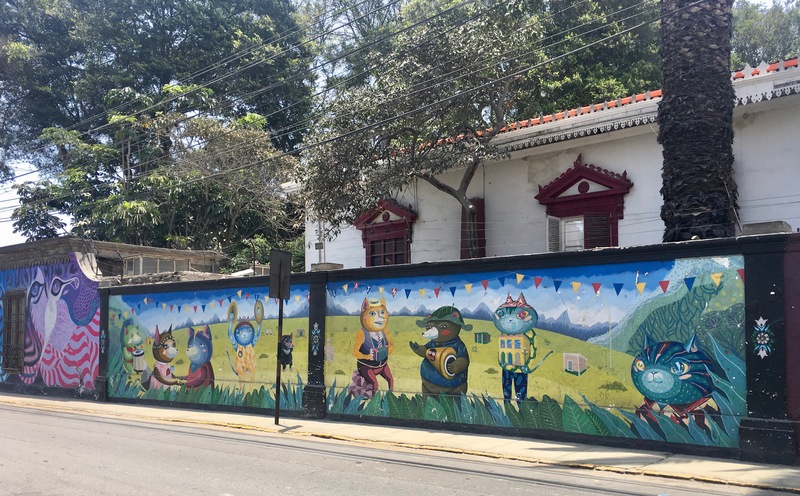 These guys do wonderful murals and pieces all over Lima: Their ambitious scenes are packed with cheerful patterns and bright woodland creatures with imaginative personalities. They seem to have a particular fondness for cats, which usually have big, multicolored eyes. 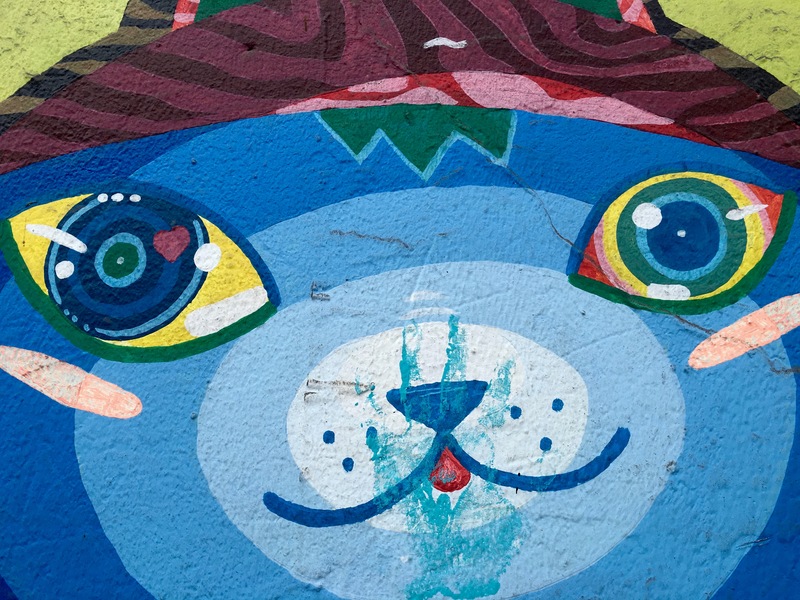 Los Salvajes are also responsible for the original face on Barranco’s resident cat-bus, which doubles as a small children’s library in a park near my apartment. Cat-bus has been looking a little hungover since his makeover though… He’s still fun to see, but definitely hairier and less kawaii. A smaller mural by Bronik is tucked on an interior wall. Bronik does eyes upon eyes and figures will bright blue skin, among other bizarre and brightly colored creations. Her contrasting colors and the beautiful patterns on her characters’ hair and skin are pretty distinctive. Finally, there was originally a different mural on the final panel of this street: I’ve only saved one photo of it, but for posterity’s sake, it’s below. 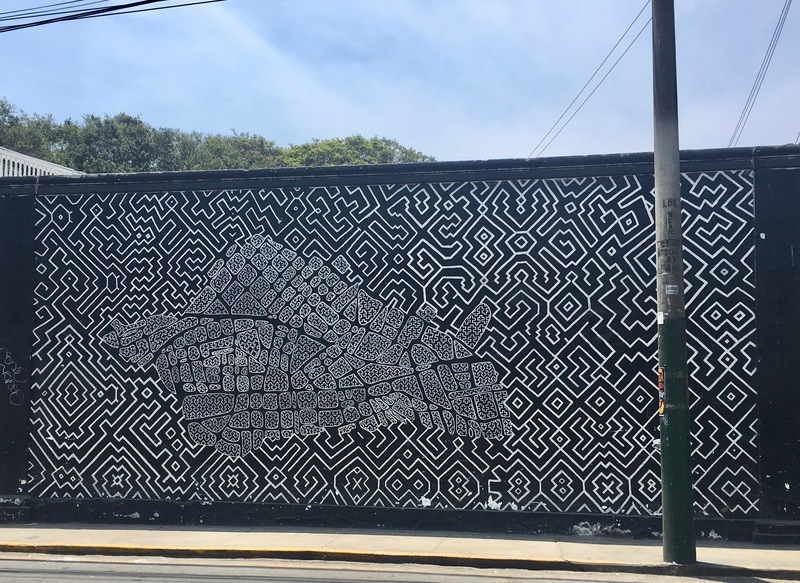 This angular, abstract mural has been replaced by a single-tone, almost hyperrealistic mural that contrasts a bit better with the Los Salvajes landscape. 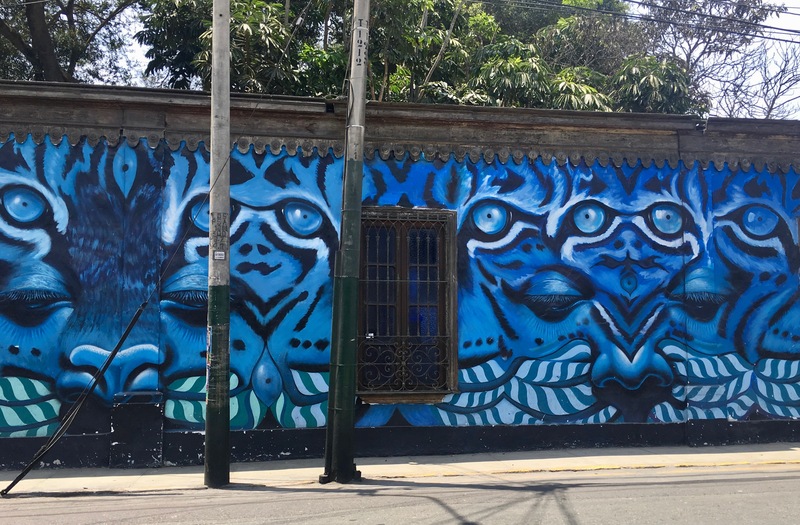 The latest mural is an incredible blending of a tiger’s face and a human’s face, which are melted together to form a rolling pattern down the wall. The blending concludes on each end with the final tiger eye becoming part of (I think) a hummingbird’s head. The skills and artistry at play in this one make it mesmerizing to try and puzzle out: What’s tiger, what’s man, and what’s… something else? Again though, I’m missing the artist on this one: I’d love to know! Deities whirling through space are my fav! Great post. Thanks for writing and sharing. Can’t wait for my next stroll through Barranco!